The VOA6-SM is a rugged, lightweight variable optical attenuator that is ideal for use in a wide range of single-mode fiber link certification and engineering test applications. Managers will appreciate its simplicity, which minimizes training requirements and speeds deployment. Field technicians will appreciate the simple thumbwheel attenuation control, which allows precise, one-hand operation. Engineers will appreciate the accuracy and return loss performance of the VOA6-SM. The VOA6-SM is a two-port passive optical device that, when inserted in an optical link, allows a technician to perform several important certification tasks. 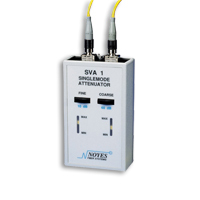 For example, when the fixed output level of a laser transmitter is too high for downstream devices, the VOA6-SM can be used to determine the amount of fixed attenuation required to match power levels. Alternately, during activation and certification of a new circuit, the VOA6-SM can be used to vary the amount of link loss and determine the optical headroom of the circuit. The 45 dB optical return loss of the VOA6-SM makes it ideal for use with sensitive DFB laser transmitters and other devices that can be degraded or damaged by reflected power. The VOA6-SM is calibrated at key FTTX wavelengths including 1310, 1490, 1550, and 1625 nm and can be used in the calibration, engineering, and production test lab as well as in the field. Its rugged construction ensures many years of service. The VOA6-SM operates on an internal Li-Ion battery and includes a 10-minute auto power down and 60-second backlight power off capabilities. An AC adapter and battery charger is standard with every unit.